Our General Assembly will happen Thursday, October 27 at 18:15 in BC 410. If you’re interested in organizing events and meeting a bunch of cool people, come see us! Please fill this doodle so we know how much food and drinks to get. Registration for the Swiss Subregional contest are now open! Win a trip to Paris to represent EPFL, register now! PolyProg will be at the EPFL Associations Week, from 11:00 to 13:00 this week. The second edition of the Martian Challenge is coming soon! It is sponsored by Agepoly, the EPFL students general association, and Bloomberg. The Helvetic Coding Contest is coming! 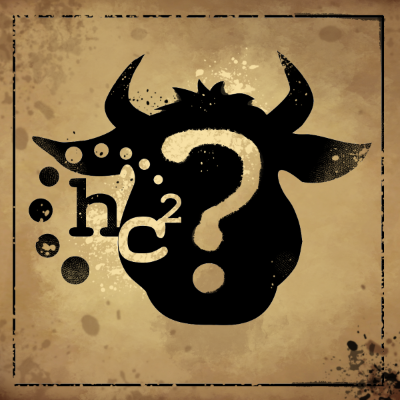 Help us find Heidi, our mascot, who seems to have gotten lost… More info on hc2.ch! Our General Assembly will be held on Wednesday, October 19 at 19:00 in BC 410. Not a PolyProg event, but you may find it interesting! CodeCon is a programming contest developed in-house at Bloomberg. Push your programming and problem solving skills to the limit against the clock to win the title of Bloomberg CodeCon Champion! The qualifying round will take place during the EPFL Forum in INF 1 and 2 at 6PM, 13th October 2016. What’s this PolyProg thing anyway? Can you eat it? Does it move on its own? Come find out who we are and what we do at our annual Welcome Event! It will take place on October 5th at 18:00 in BC 410. Do you think you have what it takes to represent EPFL at the ACM ICPC SouthWestern Europe Regional Contest, and maybe go on to win the world finals? Or do you just want to discover algorithmic contests and test your skills? 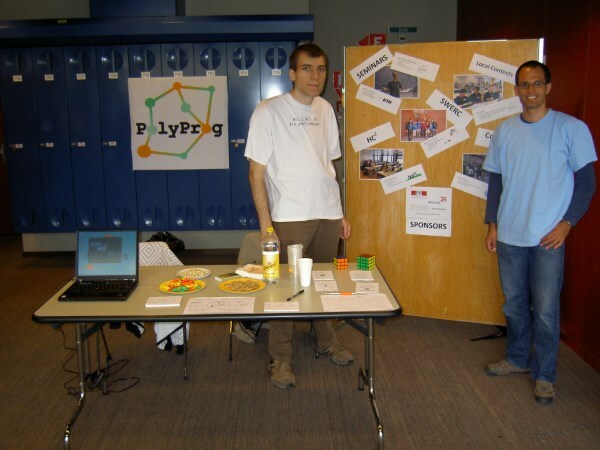 PolyProg is organizing the selection contest for SWERC on Saturday, October 8 at 10:00 in INF 2/3. Please register if you’re interested. Jonas Wagner presents techniques on how to become a faster competition programmer. Santa came and brought many exciting programming challenges. Congratulations to the 82 teams who solved them! You can now access pictures and the final scoreboard of the competition. This Wednesday, November 18, at 18:15 in INF3, we will give a seminar about path-finding algorithms. Topics will be Dijkstra, Bellman-Ford, A*, and others. The seminar will be given by Christian Zommerfelds. Anyone is welcome to join. Hope to see you there! The Amirkabir University of Technology (Iran) is organizing their ICPC selection contest on Saturday, November 20, at 11:00 CET. For the first time, the contest is open to teams from other universities. If you would like to participate, register online. We are excited to announce the third edition of Santa’s Algorithmic Challenge, which takes place on November 30! Please find here more information about this Christmas-themed contest and don’t forget to register before November 23. See you there! We are having another problem solving seminar this week, on Wednesday, November 4, at 18:15 in INF3. This time we will tackle more complicated problems. We’ll use the problems D, G and H from the previous Selection Contest problem set. If you need access to the problem, please contact president.polyprog@epfl.ch (the problem set is not public). Jakub Tarnawski will go through these three problems and explain how you can solve them within the time constraints. Hope to see you there! In this seminar, Jakub Tarnawski explained how to solve the easier to medium problems of the selection contest (i.e. problem B, E, C and I). If you are interested to follow those seminars, please subscribe to the PolyProg newsletter. In this introductory seminar, Jonas Wagner covered problem A of the selection contest as well as general advices for programming competitions. PolyProg would like to thank the former treasurer, Jonas Wagner, who contributed in an outstanding way to the association for many years! Furthermore, we have decided to abolish membership fees. However, we will accept donations from people who also want to contribute in a financial way. Do you think you have got what it takes to represent EPFL at the Southwestern Europe Regional Contest in Porto? Then register quickly and become one of six lucky coders to travel to Portugal this November. The Selection Contest is an algorithmic programming contest. Microsoft will be sponsoring this year’s event and throw in some cool prizes, among them an Xbox for the best participant at the selection contest. Microsoft will give a tech talk about Big Data. We will expect you on the 10th of October, 10:00 in front of INF3. Snacks and Drinks will be provided. During this event we will present what our association does and how you can get involved. Afterwards there will be an apÃ©ro. This contest will determine who gets to represent EPFL at the Southwestern Europe Regional Contest in Porto. An official meeting where you can become an association or even a committee member. The biggest programming challenge in Switzerland! Have fun solving problems in teams of up to three people. We are also recruiting members for the contest committee, send us an e-mail at info@hc2.ch if you’re interested. 11 March 2015 Helvetic Coding Contest coming up! The 6th edition of the Helvetic Coding Contest will take place on March 21st. Check out the HC2 website. PolyProg will host a hub for Google Hash Code 2015 at INF 2. Feel free to join, but register at doodle.com/c5r54wy772spddyd. Be there at 18:15. Happy coding! Seminar: Introduction to competition programming: Tuesday, November 4, 18:15 in BC07/08. The seminar will cover how to practice for competitions, and an overview of the most useful programming language features. Advanced Seminars: Dynamic Programming, Monday November 3, 18:10 in INF 211. The other seminar days to mark in your agenda: November 10, November 13, and November 17. Saturday training competitions: Participate online in a virtual contest on the PolyProg group on CodeForces. The contest is “virtual” because you can start whenever you want. The contest ends latest on Saturday 15:00, when the coaches will explain the problems and their solutions. You can participate as a team or alone. November 1: 2014-2015 ACM-ICPC, NEERC, Eastern Subregional Contest. Damian will discuss it at 15:00 in INJ 110. Stay tuned by subscribing to the PolyProg Google Calendar and liking PolyProg on Facebook! We encourage everyone to participate in the selection contest, you don’t need to be a PolyProg member and you can be an exchange student. If you make it to the top 6, and intend to represent EPFL at SWERC please consider the ICPC eligibilty decision tree and bring a passport. Registration is necessary for the selection contest and can be done here. We will provide snacks during the event. PolyProg offers you a number of activities this fall. Yeah! Come to our selection contest for SWERC on October 11, 12:00, INF3. This contest requires online registration. There’s plenty to learn at our weekly seminars and practice sessions that will start mid-October. Sure! Click on “Login” above, and we’ll send you our newsletter. Want to learn more about PolyProg? Thinking of getting involved? Interested in Algorithms and Programming? Come to our General Assembly on October 1, 18:30 in BC01. We will present our association, show pictures and reports of past PolyProg events, and discuss the coming season. It will also be the time to elect the committee and find people that are interested in joining the association to make exciting programming events happen. An apéro awaits you at the end of the GA.
On December 9, the first edition of Santa’s Algorithmic Challenge will be held at EPFL! Register quickly, places are limited. The selection contest for SWERC 2013 is over and the ranking can be seen here. We congratulate the winners on their great achievement and and wish them all the best for the contest in Valencia. Congratulations also to our colleagues in Zürich. 8 October 2013 Selection Contest Registration is open! You may now register for our selection contest on http://swerc.hc2.ch/. Put your programming skills to the test and win a trip to SWERC in Valencia, Spain! The contest will take place in INF2 from 11:30 - 18:00. 13 September 2013 Welcome (back) on Campus! 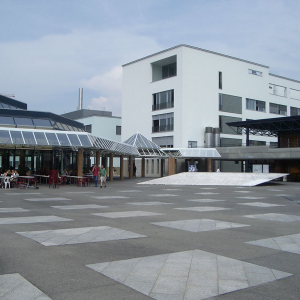 PolyProg welcomes you onto the EPFL campus for a new academic year that will be full of projects, fascinating subjects and student life. To foster long-term success without having the latter fall by the wayside, PolyProg invented a leisure time creator. It is, as is any real system, causal, meaning that an initial investment is required of you in order to reap its benefits. 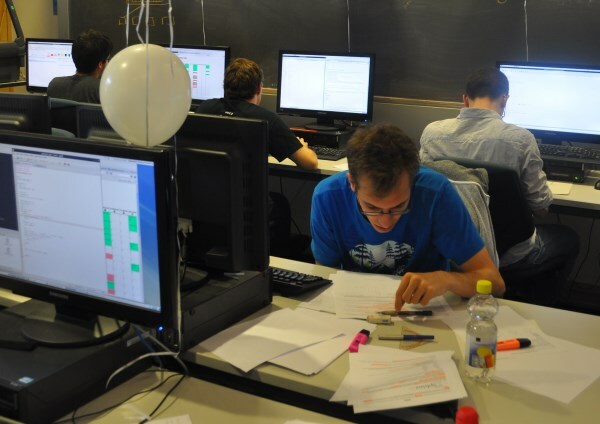 The Helvetic Coding Contest 2013 is history! 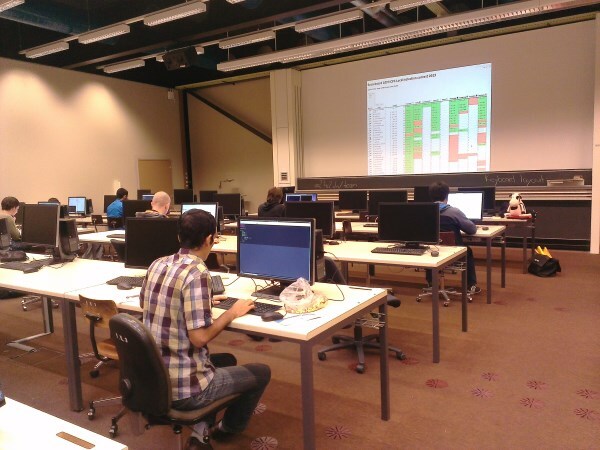 Once again, the best coders from all over Switzerland have met at EPFL in Lausanne to demonstrate their abilities in algorithmic coding. We are currently working hard on our next big event: The Helvetic Coding Contest! We are aiming at providing you with some seminars starting February 21st, so that you are all well prepared ;). as a further seminar of our beginner seminar series, Nikolay will explain to you the very basic algorithms when it comes to graphs, Breadth- and Depth-First-Search. You will learn how to implement graphs and how to traverse them using these methods and will solve some basic tasks related to these algorithms. We will in later seminars build up on that knowledge to develop more complex graph algorithms. See you on Thursday, 18:15 in BC 07/08. Tomorrow’s facebook contest will be hosted on InterviewStreet. It is an individual challenge; you are given a problem statement and 90-120 minutes to solve it using any programming language supported by InterviewStreet (C++, Java, Python, PHP etc…). 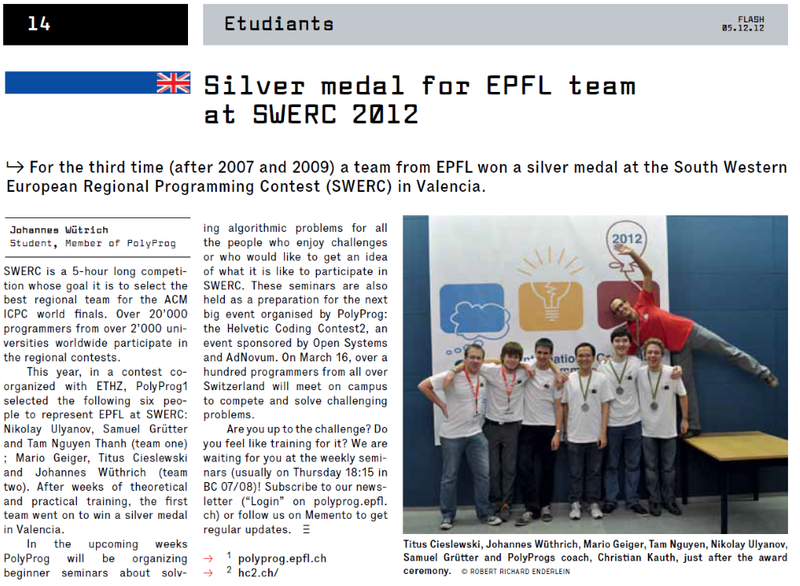 Results from the SWERC contest in Valencia have just arrived. We congratulate the team “Poly Knights” for their excellent 7th place, and team “Evil Poker Faces from Lausanne” for achieving the 21st place (out of 44 teams). More information and team pictures are online. This Thursday 22nd, PolyProg will be hosting a short programming contest hosted by facebook (facebook will be at EPFL earlier that day: http://carriere.epfl.ch/). Join us and show off your programming skills! As usual, we will meet in BC07/BC08 at 18:15.
do you have experience in iOS/Android development? Do you want to expand it while making money? 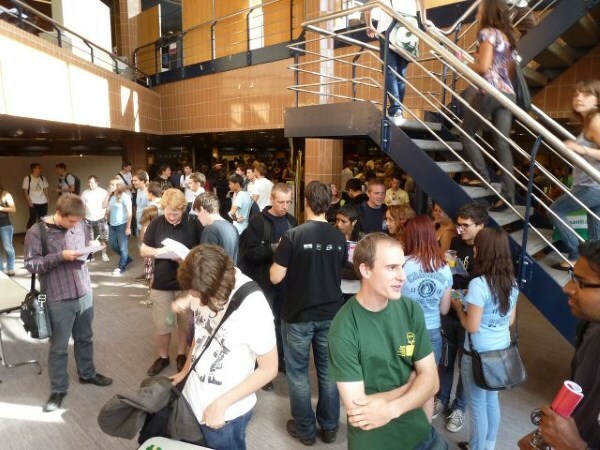 Junior Enterprise EPFL is an association that helps companies who want to launch small projects find students to do it. Recently, a lot of projects are about mobile app development, and Junior Enterprise is looking for people with knowledge in that domain. Current or prospective projects range from static information display over QR code applications to bluetooth networking! And I hear the pay can be significantly better than what you get as teaching assistant ;) . Also, congratulations to Jeremy Constantin for scoring the highest rank in the contest! Unfortunately, Jeremy is no longer eligible to participate at SWERC. Tomorrow, Saturday October 27th is the big day, where we will select EPFL’s 6 best coders to represent our institution at SWERC in Valencia (Spain) on November 17-19. Seminar 1 “Reading Hieroglyphs slides are online ! Seminar 2 “Traveling with the Salesman” slides are online ! Welcome Contest results are available. Congrats to all participants! PolyProg Points Challenge 3 is available, Challenge 4 will follow soon, be ready! PolyProg’s point challenge is accessible under polyprog.epfl.ch/points. 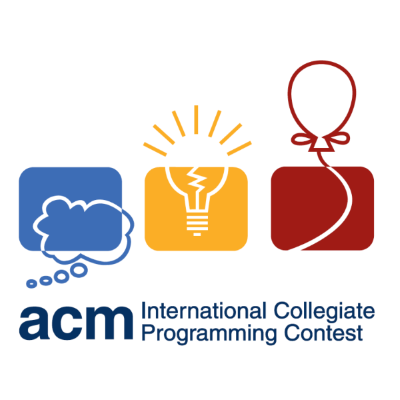 Participate in the challenge to significantly increase your chances to represent EPFL at the regional ACM ICPC contest in Valencia, Spain. To register for the PolyProg newsletter, please click on the “Login” link on the top left of the page. With the semester beginning, also PolyProg’s seminars, challenges and contests are back. They take a fulminant start - make sure to jump on the bandwagon! Read out latest article in EPFL press. Want to win a trip to Valencia? We offer a free journey to the six persons who collect the most PolyProg Points. Have a lot of fun! The spots in the computer labs for hc2 go like hot cakes. By now we are still able to accommodate some further team, but please take good note that the preregistration deadline is February 29th. Make sure you get one of the 100 tickets to compete and have fun at Switzerland’s greates coding contest at EPFL on March 17th! Registration is open and here’s the recipe to success. The exercise for seminar 4 is available now. You should have received login credentials by e-mail (otherwise, register to our news-mail first). Note that a VPN connection is necessary to access the server from outside EPFL. Congratulations to the PolyProg team (Anton Dimitrov, Andrei Giurgiu, Christian Kauth) to their 19th place out of more than 1’000 teams (semiofficial result)! Kudos to all 38 contestants who acted in our thrilling joint EPFL/ETHZ selection contest. At the end of the day, there could be only 6 students to represent the colours of EPFL at the regional finals of the ACM ICPC in Madrid on November 19-20. The 6 candidates are (ordered by their rank in the contest): Cheng Zhong, Tran Le Hung, Talau Cristian, Johannes Wuthrich, Mihai Moraru and Przemyslaw Pietrzkiewicz. As back-ups qualified Robin Steiger and Octavian Ganea. The selection committee will announce the final constellation of the 2 EPFL teams (with 3 contestants each) after next week’s training camp at ETHZ. Last but not least, we’d like to emphasize the exceptional performance of Andrei Giurgiu, who finished as best EPFL student and 2nd overall! Selection of the 6 students who will represent EPFL at the ACM ICPC regional finals in Madrid November 19-20. Our contest is open to everybody but only SWERC-eligible students may qualify for Madrid. Register now. Get a good last training at our weekly seminar in BC07, 18h15 this Thursday! You may look up the slides of our first seminar on our moodle. To submit your codes from home, you need to connect via VPN. Welcome Contest : A 3-hour contest on October 1st, 2pm, INF1 (level: beginner & advanced). Results. General Assembly : Within 1h, you’ll know what hides behind the name PolyProg and might get part of it if you wish so! October 4th, CM106, 18h15. First seminar : Did you enjoy our campus-traversal quiz? How did you solve it? In this first seminar we’ll show you how to get the computer solve it for you! If you know already about this algorithm, we’ll have a more tricky related problem for you :). BC07-08, October 6th, 18h15-20h. Code your AI that plays quantum tic-tac-toe against opponents from all around the world - from September till January. To keep your grey matter in shape throughout summer, we challenge you with a problem from IOI 2011 (proposed by our president). You can find the other tasks and their solutions here. 27 June 2011 Summer time! The PolyProg committee wishes good luck with the remaining exams and a decent summer! See you at the associations welcome stands on September 16th! The contest’s qualification round takes place this Saturday. Congratulation to the top 3 of the PolyProg Spring Contest: Titus, Peter and Utkarsh! Christian and Peter are preparing a tiny and easy 2h contest (3 problems) for this Thursday, 18:15 - 20:30 in BC07/08. Make sure to come! No subscription is needed, just flock in as you please. PolyProg launches its series of spring seminars this April 7th. At this 1st seminar we teach you how to properly brute-force and then tune your code tremendously via fantastic tricks! There will be some theory, and a lot of practice! By implementing the codes yourselves during the seminar, you get the best of it! The overall goal of this seminar series is to prepare you for the selection contest (early October) to SWERC 2011 in Madrid, for which we hope to get some fresh blood into the team. We’ll continue then with advanced seminars for proper preparation of SWERC in October and November. Congratulations to all 83 coders in the 30 teams !! You can fetch your diploma from ELB241 in case you missed the award ceremony. Are you tempted to participate in the Helvetic Coding Contest on March 12th, but have no team yet? Then this seminar is the place to be! Discuss with other interested participants and build your team before the early-registration deadline of February 25th. Precious tips and tricks await you during this 45’-session in CE103 at 18h15. PolyProg will pay the 5CHF registration fee for its members (i.e. all students having purchased a membership card for 2010-2011). 8 February 2011 HC2 posters out there! You may or may not have seen them already. Gather your friends and register! For the second time, PolyProg is going to organize the Helvetic Coding Contest. Check out the website and make sure to participate! 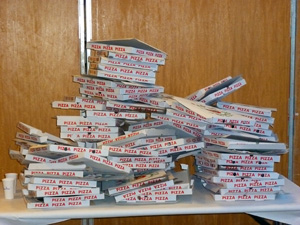 31 January 2011 CodeCup outcome! CodeCup 2011 is over and PolyProg congratulates its three participating members (12th, 25th and 35th) on their initiative! Taste PolyProg’s delicious Christmas cake (for free!) during a talk on “Fair parting” and “Alpha-beta pruning”. Get into Christmas mood with us in CE 103, Thursday, 16th from 18h15 to 20h00. 18 November 2010 SWERC this weekend... and thereafter? 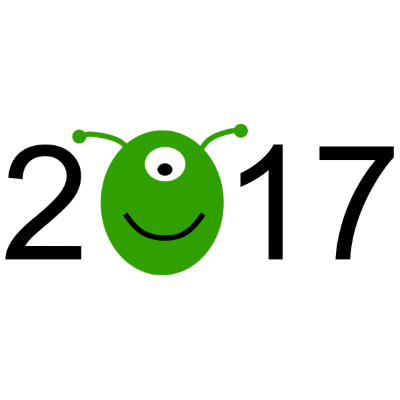 This weekend, as you might know, the first part of the PolyProg year will conclude with our participation in the SWERC. But what will happen next? Well, no need to worry, we have something to play around with for all of you: We are going to participate in CodeCup 2011! For that we will be working on an artificial intelligence for a game. Curious? Then come to our seminar on the 25th of November at 18:15 in BC07/08! The seminar will be held thursday at 18:15 in CE103. The selection committee compliments all 5 teams on their achievements in this tough contest. We will organize for ALL of you a series of advanced seminars where you will be shown how really difficult problems can be solved. The first of them will take place next Thursday 18h15 (room indication will follow) and will handle the problems of the selection contest (read through them on our moodle in advance, as we will just cover the solutions. The Contest will be held this Saturday, October 30th at 12:30-18:00 in INF2. The seminar will be held in BC07/08 on Thursday at 18:15, as usual. This years Selection Contest will be held this Saturday, October 30th at 12:30-18:00. We don’t know yet in which room, but we will let you know as soon as possible. As usual, there will be food and drinks available. To see the problems of last years selection contest, view the section “Training”. The SWERC participants from the ETH in Zurich have invited us to join their training week from october 18th to october 23rd; there will be daily training contests and seminars held by a former ACM ICPC World champion and a Russian ACM coach. … will be held again in BC07/08, Thursday at 18:15. 8 October 2010 Join Online Contests! Whether you are preparing for SWERC or not - join online contests, just as Christian suggested in our first seminar! They are fun, you can practice cooperation in your team or just ameliorate your skills if you compete alone. As some of you probably already know, there is a moodle page to support the seminars. Get the link and the enrolment key on the Events -> Seminars page. 2 October 2010 Our next event - This year's first seminar! What exactly is a graph and how can one represent it in a program? What are good searching strategies and how do you find the shortest path from vertex A to vertex B? We will have a look at those and other questions in our next seminar, which will take place this Thursday at 18:15 in BC 07/08. The general assembly of tomorrow, 29th of September will take place at 18:15 in CO 123. You can participate in the contest with no prior registration. During the association booths, we were delighted to introduce some people to Polyprog; thanks for coming everyone!